In keeping with The Bahamas’ thrust to improve domestic production and adoption of agriculture, the “Strengthening Livestock Production” seminar hosted by CARDI Bahamas and the Ministry of Education served to introduce teachers to best practices in ruminant and small ruminant production. On the opening day, participants were familiarised with a variety of unconventional materials that can be used as alternative feed sources for ruminants such as sweet potato, banana, cassava and coconut. As pressures exacerbate shortages of feed resources, non-conventional sources are options available to farmers for supplementing feeding in a cost effective and efficient manner. Teachers were presented with Moringa, Trichantera and Mulberry plants and issued a challenge to start their forage banks. Day 2 focused on layers and table egg production. Bahamas produces less than 2% of the chicken it consumes annually! 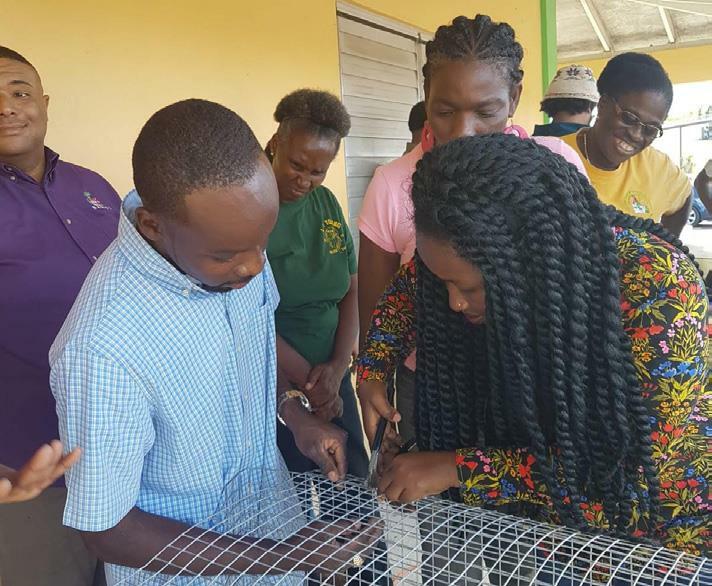 Participants were exposed to housing requirements for layers and received hands on training in the construction of battery cages for single and multiple birds. Strengthening the capacities of Agriculture Science teachers mean they are now better equipped to deliver a more diversified and innovative programme as well as oversee the implementation of science based projects in schools. Teachers are key to ensuring students have access to the knowledge, skills and experience needed to adapt to a more sustainable future!